At St Augustine’s we focus on engaging students in vibrant, creative learning experiences that develop inquiring minds. Our aim is to develop students who are able to think deeply and critically, interact, create and collaborate effectively in a global world. The prescribed Victorian Curriculum is used to frame learning that is responsive to the children’s needs, the context of our school and the wider community. Students now need to think, learn, know and do. They need to know how to find information that will help them to answer questions, analyse what they discover, present this learning and use it to make sense of the world around them. At St Augustine’s we use the Inquiry Learning approach. Inquiry based learning is an approach to teaching and learning that places students’ questions, ideas and observations at the centre of the learning experience. Learning is driven by student interest, prescribed curriculum, and relevant questions. Throughout the Inquiry process, students are taught to explore, question and seek answers before sharing their new discoveries. Active and effective participation in Australian society depends on the ability to speak, listen, read, view and write with confidence, purpose and enjoyment in a wide range of contexts. The learning of Mathematics empowers students with the skills and strategies necessary to successfully navigate and solve problems independently in their everyday lives and in the real world. At St Augustine’s students participate in rich learning experiences designed to develop their mathematical knowledge and skills, reasoning and thinking, problem solving and investigation. 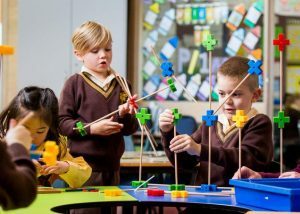 Mathematics is integral to all aspects of life and with this in mind we endeavour to ensure that children develop a healthy and enthusiastic attitude towards Mathematics. Mathematics at St. Augustine’s is based upon the Victorian Curriculum which focuses on the strands of Number and Algebra, Measurement and Geometry, and Statistics and Probability. Weekly Specialist Programs are taught from Prep to Year 6 by specialist teachers. At St Augustine’s, classroom teachers and Mathematics and Literacy experts use diagnostic testing, work samples and observations, to identify students who would benefit from specialised assistance or enrichment. Students from Year 4, 5 and 6 who have shown strong Number skills are extended by participating in the Australian Problem Solving Mathematical Olympiads Junior section. The students complete five papers of 5 questions each that utilise and challenge their problem-solving techniques. This intensive program for students in Years 1 – 4 aims to develop strong mental strategies and mathematical knowledge. Reading Recovery is an intensive, one to one, early intervention program designed to support Year 1 students having difficulty with reading. Reading Recovery is an early literacy intervention program. It aims to help students develop reading and writing skills so that they develop greater independence. Selected students are removed from the classroom for 30 minutes of individual instruction each day. A small group reading intervention program for students with identified needs in Literacy. This program aims to increase students’ reading comprehension skills and improve reading confidence. Access is provided for Parents of gifted and highly able children to enrol directly into the various programs being offered throughout the year. These programs include: Brainwaves Club, Eureka and Journeys Programs.